ChocolateBar is a potentially unwanted program which you may install accidentally. As researchers have discovered, the application is distributed using software bundles that may be introduced by Safer Installer Stub, Fusion, and other third-party installers. Even though we do not identify the PUP as malicious, it could be installed with applications that you will need to delete from the system to keep it safe. We can help you remove ChocolateBar-related applications from the Windows operating system. If you visit lb.we-care.com/chocolatebar, you will be informed that the potentially unwanted program is powered by We-Care.com. The company promises to support the causes selected by you whenever you shop online. Even though the intentions are commendable, we would not urge users to delete ChocolateBar from system if it was not necessary. Unfortunately, it has been discovered that the program works like an advertisement-supported program, which means that if you do not remove the PUP, you could be introduced to potentially unreliable advertisements. The parties presenting advertisements are undisclosed, which is why our malware researchers do not recommend trusting them. If you decide to interact with ChocolateBar ads, make sure you research the promoted services and products and ignore data-collecting surveys/prize-giveaways. You will avoid other risks if you choose to remove ChocolateBar from the operating system. Even though the removal of this PUP may seem unnecessary right now, we urge you to at least consider this. You can install automatic malware removal software to delete ChocolateBar from the PC. This software is invaluable, because it can remove other undesirable programs and protect the operating system at the same time. If you have already decided to remove ChocolateBar manually, follow the steps below, and then install a malware scanner to make sure that the conducted removal was successful. Navigate to the left corner of the Task Bar, click Start and select Control Panel. 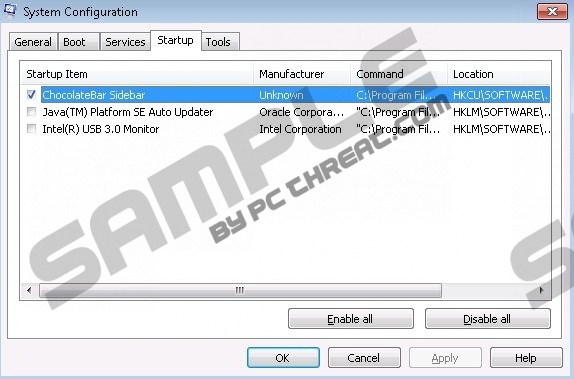 Double-click Add or Remove Programs and open the Change or Remove Programs list. Navigate to the Task Bar and click the Windows icon on the left to open a menu. Select Control Panel to open a different menu and then click Uninstall a program. Right-click the application you wish to delete from the computer and select Uninstall. Tap the Windows key to access the Metro UI screen and right-click on it to open a new tab. Select All apps, then move to Control Panel and finally click Uninstall a program. Quick & tested solution for ChocolateBar removal. Why does the program ChocolateBar ask for permission to make changes to my computer when I try to un-install it? is this safe to select YES?